Sun Exchange is off to Singapore next week for Asia Blockchain Week! We will kick things off at SolarPlaza’s Blockchain2Energy Asia on Tuesday, 27 November at Suntec Singapore. 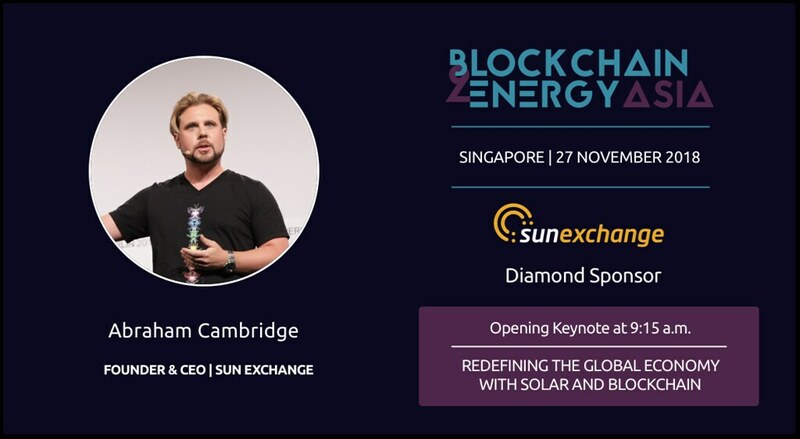 Sun Exchange is a Diamond Sponsor at the conference and our CEO and founder, Abe Cambridge, will deliver a keynote on his vision for how solar energy and blockchain technology combined can power a new global economy of abundance that will benefit all humanity. Abe will also speak on a panel discussion about new renewable energy finance innovations, exploring how blockchain is unlocking new sources of capital for clean power. Sun Exchange primarily operates in South Africa, yet we know it’s important that we bring our message to audiences in Asia as well. While Asia, and particularly China, is an established leader in the global transition to solar power, many sunny, developing Asian markets still grapple with the same funding roadblocks and obstacles to solar deployment that Sun Exchange and blockchain-based finance solutions can address. Additionally, South Asia is second to Sub-Saharan Africa in population lacking energy access -- another massive challenge that can be addressed by combining solar and blockchain. From there we will head to Cointelegraph’s BlockShow, where the conversation will be about blockchain’s coming of age. Started in 2014 in the days before Ethereum existed, let alone ICOs, Sun Exchange was one of the earliest movers in the energy/blockchain space, and established a successful and profitable business model. This sets us apart in the blockchain industry, where so many of the emerging players have great ideas, but no viable, operational solutions to offer. With a deep roster of experienced entrepreneurs, investors and innovators, BlockShow is set to be an event that cuts through the hype to demonstrate real progress and applications for blockchain. We look forward to many illuminating conversations that move the industry forward. Despite regulatory challenges and uncertainty, Asia continues to be among global regions leading in innovating and advocating for blockchain and the crypto-economy. This is great news for the industry, given that Asia is a massive hub for global growth, and home to some of the world’s fastest growing economies. Our team anticipates an exciting Asia Blockchain Week full of learning, exchanging world-changing ideas and making new friends across the globe.